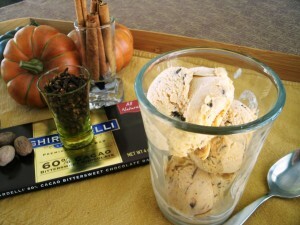 This entry was posted in Cooking and tagged chocolate, dessert, ice cream, pumpkin. Bookmark the permalink. I’ve been waiting for a recipe like this!!! We recently purchased an electric Cuisinart ice cream maker which we love. So easy! Had to ditch the more expensive Donvier hand-crank model as none of the recipes turned out right (could have been the operator) became frustrated, and the unit sat in the pantry for the past seven years. Sad, I know! Anyway, we havent gone beyond making the vanilla flavor with various mix-ins, and this Pumpkin Pie Chocolate Chunk Ice Cream recipe has me drooling. I, too, love fall, and it certainly is a challenge to prepare fall recipes here in FL. Thanks, Scott, for posting this. Can’t wait to try it! Well, Roxanne, we have the Cuisinart as well as a larger Krupps. This size batch works well for the Cuisinart – but if I want to double it, I find the Cuisinart defrosts before the ice cream sets. Don’t have that issue with the Krupps. But of course, the Krupps is harder to clean, etc. Good luck! Made it yesterday. I am in love….sweet dreams after finishing the whole batch before bed. (Zack helped!). Guess I will be making more tomorrow for company. Nice job, Scott!!! !